Rockman Corner: Rockman EXE: Operate Shooting Star English Translation Patch Released! I had asked the question of how can I patch the game with this and it got completely ignored... I have a chromebook so it won't read exe files... Can someone patch this with a NDS file and upload it? 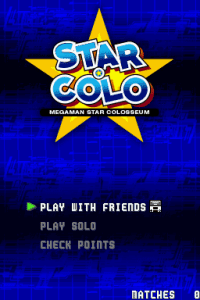 Download a rom of Rockman EXE Operate Shooting Star, then put the rom inside the folder of the patcher and the translation file. Open the .exe and place the rom file and the translation file directions, then hit the patch button. Done. This is pretty awesome. Though I have to wonder now, if anyone would be porting this to cartridges and selling them on Esty for those who want to play it on their DS like the Ace Attorney Investigations 2 Prosecutor Path and Magical Vaction and Dragon Quest Monsters 3 Caravan Heart english ones are doing? Probably easier and cheaper to just get a DS flashcart instead. I would prefer to play it on my DS, but if I have to I'll settle for cpu. GIGAXISBASS You called it. I was hoping someone on Esty would create a reproduction cart for Operation Starforce.. I kept checking Esty every so often, until I checked today and ill be darned. Someone actually did it. Lol. Says that there's only 1 available. Congratulations but why not MegaMan EXE Operate Shooting Star? 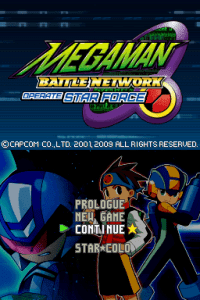 Probably because since this is the english version it would go by the english version's title which is Megaman Battle Network since Rockman EXE is the japanese version's title given every game in the series went by those names in their respective countries. Same for Starforce and Shooting Star, Ryuusei No Rockuman Shooting Star Rockman in literal translation and Megaman Starforce for official english. 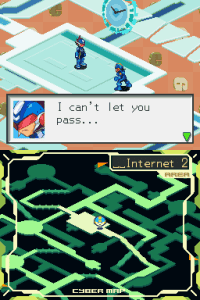 Because it's called Mega Man Battle Network over here and not MegaMan EXE. They changed the name in Japan but even when they changed it to just Rockman EXE in Japan it stayed as Mega Man Battle Network overseas. Well, Mega Man Battle Network Operate Star Force is the closest thing to a fully localized title it would get. 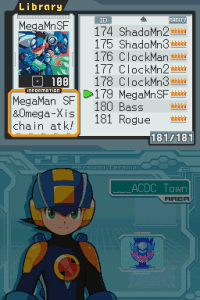 Rockman.EXE = Mega Man Battle Network, Rockman Shooting Star = Mega Man Star Force, fill in the blanks. It seems like the translators wanted to treat it like it were an official localization, so they used the English titles for both series. The Mega Man Star Force series is known as Shooting Star Rockman in Japan, just like how Megaman Battle Network was originally Rockman.EXE. Thank you guys! I understand. So, I'm using a flashcart, patched the .nds file and everything. The english patch works great, but the encounter rate in the net is ridiculous. I can't take one step without running into a virus, anyone else having this issue? http://forums.therockmanexezone.com/single/?p=10002191&t=10030816 Anti piracy patch. There ya go. Anyone else having this issue with the encounter rate? Hello can anybody help me I am using my mac and i can't seem to patch the freaking thing! can anybody help me? Anybody else having a problem where is crashes right before you enter the final level? The whole game's run fine so far, but when I try to enter the area behind the fountain at the school my game invariably crashes. Just wanted to see if anybody else had the same problem or if it's just something with my system.